Shopping in Luleå in the northern parts of Sweden was the first indoor shopping mall in Europe. 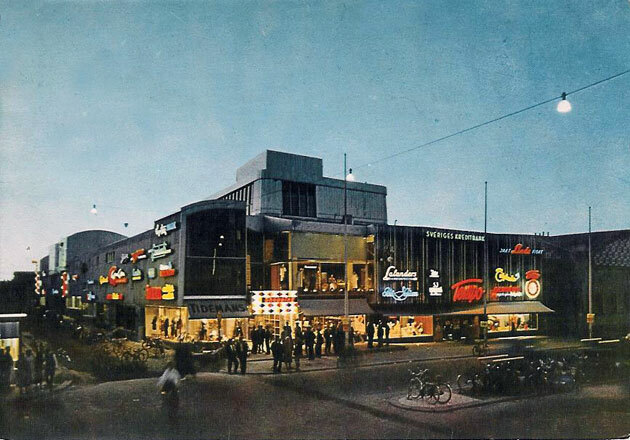 Built in 1955 and designed by the famous architect Ralph Erskine, who wanted to create a mall for people to enjoy and socialize – even with the cold winter climate of northern Sweden. Apparently he got the idea while visiting a outdoor shopping mall in Canada, during the winter. Shopping had a very modern and futuristic look, often referred to as “brutalism“. Raw, naked concrete pillars, walkways, and catwalks connecting the different levels created this rather characteristic look. At the top of the complex were a car exhibition, a symbol of the promising 1950s. The cars were lifted to the top using lifts from the outside. The mall was instantly a hit, with soon to be bond-girl Maud Adams posing on various postcards and billboards. Shopping also featured a rather large movie theatre that was modeled after a cave. Unfortunately it was closed in 1988 and has not been open since then.